If you're planning to produce the content for a new website or app read on. I promise it will save you pain and heartache. The simple truth is: producing (good) content is not easy. I bet it takes me far longer to write this post than I expect. By the time I've drafted it, edited it down, uploaded it into the CMS, tweaked the HTML, and published it. ... It would take even more time if I needed to do lots of research or get it signed-off. It is my job as content strategist to know how long it takes to produce content, but even I still underestimate it. Which is especially dangerous when you're populating an entire site with content when the scale of production dramatically increases. And this is why website projects are frequently delayed while the content production catches up with the design and coding work streams. Before you take another step in your website project, give you and your project people a healthy fright and respect for the content challenge ahead of you. Your project and site will be much better for it! STEP 2. 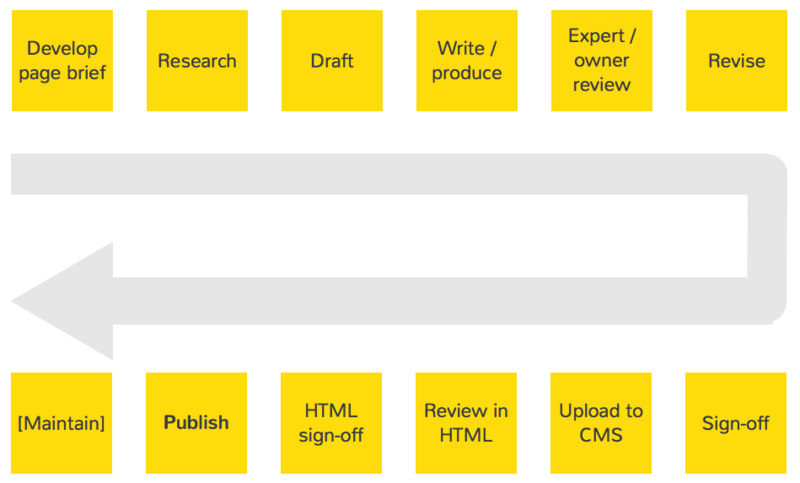 As a team, map out an appropriate content production process for getting a single item (usually a page) of content published on the new site. Use a big sheet of paper. Use this diagram as a starting point and add stages as required. Post it notes are best. A typical production process flow for a piece of content during a web project. Each business is different and extra stages like Legal review are common. Tip: you may not yet be sure exactly what content your new site will have and therefore what you're designing a process around. I say: still better to go with what you know, rather than miss this step or wait until it is too late in the project. BTW: Don't ignore or underestimate the effort to 'migrate' existing content from an old site to a new site. That content probably needs to be reviewed, updated, and uploaded again. STEP 3. Annotate each stage in your process with the person and / or role responsible for it. Note any stages that don’t have a clear owner. Do the labelled people even know they are responsible? Tip: Colour-coded stickmen stand out really well. STEP 4. Review the stages and note any potential pain points or bottlenecks. is too much responsibility and workload falling on one person? where do things (usually) get political when we produce content? STEP 5. Estimate how much effort (as fractions of hours) each stage could realistically take to execute. Write that number against each stage nice and big. Tip: I prefer clients to estimate the actual man hours of work required to complete the step rather than the span of time it takes for the stage to be completed. Both are important though. STEP 6. Total up the hours at the end of your process diagram. Looking pretty big (for a single piece of content)? STEP 7. Multiply the estimated hours with the anticipated pieces (pages) of content on your new site. Tip: if you’re refreshing your old site go with the existing number of pages as a guide. The answer to your sum will be a sobering number. I’ve run this activity many times and there's always the same sober atmosphere that descends over the room as the reality settles in. The good news is the project team will now respect the effort of producing new content and start to make smarter decisions throughout the project (and hopefully beyond). BTW: This blog did take me longer than I expected and I didn't have to get it through Legal! Map your website content topic areas with people. ASAP. Take a look at our Content Strategist designed and delivered Content Production Planning services. We can help you to take control of your content production.